Your website may look great on the surface but do you understand how to check for simple errors that could be losing you business? Understanding that your website is a representative for your business - no different to your employees or place of business - is the first step. It's easy to see when something is wrong with an employee or your premises and the solutions are usually equally as straight-forward. The question is, how do you know when your website needs some TLC? If you care about how your website is representing your business then the following guide will help those with no technical knowledge do a quick assessment. And the best thing - it's all free! Note: The following tells you how to check for certain warning signs, it doesn't cover how to fix them - it is about giving you a degree of control, not a Degree in Computer Sciences! Does your website code validate? Just as houses need solid foundations, well chosen building materials and proper construction, so does your website. Validating your code goes a long way to ensure that many of these basics are in place and correctly used. The reason we say validation only helps is it is not the be all and end all of good website code, but it is a good indicator of its basic health. Go to the W3C Markup Validation Service and type in your web address (or copy and paste it from elsewhere), then press "check". A green light/pass is good, a red light/fail is bad - it is as simple as that! You can do this for each page on your website, or just pick a selection as a sample. CSS, or Cascading Style Sheets, control how your website looks. Some websites only have CSS for the screen, others will have additional ones for print and mobile devices. 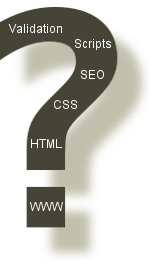 A valid CSS helps to ensure that your website complies to industry standards. This goes a long way towards making sure that your site will look the same on each browser (such as Internet Explorer, Firefox or Opera). Just because everything looks fine in Internet Explorer doesn't mean that it will be alright in the others. Go to the W3C CSS Validation Service and type in your web address (or copy and paste it from elsewhere), then press "check". Again, a green light/pass is good, a red light/fail is bad - it is as simple as that! You should only need to do this on one page of your website as the CSS file is generally the same. You may have additional CSS files but finding them is a little outside the scope of this guide. Do your images have alt-text? Most images on a website can have alt-text which is simply a brief description of what the image is. is simply removing barriers that some disabled users might encounter in using your website. Don't think accessibility is important to you? Think again! Around 15-20% of the population have disabilities that impact on how they use the Web - that is a significant proportion of your potential audience/customers. are a measure of how easily your website can be found on search engines. Google, Yahoo! and Bing don't have eyes (yet) so consider them your biggest 'blind' user and ensure your images have alt-text. Many websites enjoy major traffic boosts when they start following this practice. How to check for alt-text. There are many ways to check for alt-text but perhaps the easiest is provided by Juicy Studio. Go to Juicy Studio's image checker, enter the address of your website (or the specific page(s) you would like tested and click "Test Images". The results are very easy to understand with a pass/warning/fail given for each image found, and a key is given explaining these terms further. Is your website optimised for fast loading/rendering? What is optimisation and rendering? This covers a wide range of things from limiting the number of elements on a page (the number of images, multi-media, scripts, CSS etc), to optimising each element by reducing file-sizes, combining files and other clever 'tricks' etc. Whilst most people understand the page "loading time" the page "rendering" is a little less known. Page rendering is how long it takes your browser to draw the page on-screen once it has started receiving the content to display. Complex layouts, missing attributes in your code and even putting elements in the wrong place can seriously slow down page rendering. Important: simply looking at your own website may give you a false impression of loading time issues - once you have visited a website certain elements of it are held in your browsers memory and subsequent visits appear much faster. Just like any other part of your business you don't want to keep your potential customers hanging around. The longer they have to wait the less likely they are to use your services and the chance of them returning to your website diminishes significantly. Broadband has not diminished this problem, in fact it has only served to increase peoples expectations regarding loading time. If you have lots of Flash animation, too many images, or even just a badly coded website then it could load too slowly no matter how fast the visitors connection. Loading times could soon impact on your search engine rankings. Matt Cutts from Google indicated at a recent convention in Las Vegas that page load speed may be in Google's algorithm in 2010. Go to the Web Page Analyzer from WebsiteOptimization.Com and enter your website's address where it says "Enter URL to diagnose", then press "Submit Query". The results may look a little daunting at first. However, scroll to the bottom of the page and there is a simple green/amber/red system. Don't worry if you don't understand the terms HTML/objects/CSS/Scripts etc - the key thing is ensure you have as many green lights and as few red ones as possible. What is a spell check? Seriously? I really hope I don't need to cover this - do I? An extra-ordinary amount of content published ot the Web is not spel checkd - seriozly. Not only does this make your organisation look less-than-professional, but it can also damage your search engine optimisation as search results require accurate spelling. Does your website print properly? What is a print CSS? A print CSS (cascading style sheet) is a simple method available to web designers to enable users to print pages without the need to resort to "print friendly versions", PDFs, or other methods. Most browsers come with a "print" button so why not let your visitors use it? Not everyone reads everything on screen and there is a very good chance that your visitors will want to print your content at some point. Instructions, recipes, directions…these are just a few examples of content types that are frequently printed. Having a website that prints correctly might not exactly blow the socks off your users. However, a website that prints badly isn't exactly going to win you any fans either. The level of importance of printing varies from website to website. You need to consider this in the context of your content and your audience, but generally speaking it is sensible to allow your users to print pages easily. Most modern browsers offer a "print preview" function allowing you to check this on-screen. However, if you can't find this or find it difficult to use simply hit print - after all, that is what many of your users will be doing! This guide is aimed at helping you understand the health of your website, giving you a basic understanding of how to "check the oil and brakes". Hopefully this will enable you to have greater control over your website than before. What you do with that control is really up to you and to some extent how your site is managed and by whom. If the website is managed in-house by untrained staff to keep the budget down (as a great many are) then you can't point any fingers at the person you put in charge of it. Gently pointing the person to the validation services mentioned above is a good start, plus there are a ton of online forums that can help (just be aware that not all advice given on forums is good advice) with specific problems. It can also be a good idea to identify training needs and to produce in-house documentation. If all else fails you can always seek outside assistance but before you approach anyone 'professional' for help try running these tests on their home page!